Students in the course “Biological and Social Complexities of Drug Design and Novel Approaches to the Treatment of Cancer” end the semester by cooking dinner for cancer patients, then sharing a meal as they share their perspectives on living with the disease. 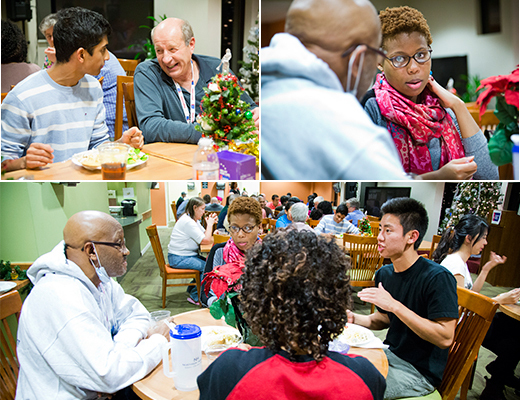 On a recent December evening, a group of Emory freshmen gather in the kitchen of the American Cancer Society's Hope Lodge, a residential center on the Clairmont Campus for patients receiving care at Emory's Winship Cancer Institute and other area treatment centers. Their challenge: Cook dinner for some 60 cancer patients and their families, then sit and talk with them, borrowing from all they've learned about the disease, its treatment and the arduous process of developing new drugs to help fight it. All told, it was an experience few in the group expected their first semester on campus. In the kitchen, the mood is nervous but jovial. Yet once they join the cancer patients, the conversation flows easily, as students discuss concepts they've explored throughout the semester through a new, very personal lens. At one table, a patient relates how a lifetime of vision problems was finally traced to a tumor. Another patient discusses her interest in naturopathic treatments. They talk of challenges and of hopes — many will be "graduating" from treatment this very night. For MaKendra Umstead and Jasmine Miller-Kleinhenz, Emory doctoral students in cancer biology, observing these interactions is a bit like watching a scenario that they had once only imagined coming to life before their eyes. Together, the pair merged scholarly interests to develop "Biological and Social Complexities of Drug Design and Novel Approaches to the Treatment of Cancer," as part of a freshman seminar class that was selected as one of two ORDER (On Recent Discoveries by Emory Researchers) courses offered at Emory last semester under the supervision of David Lynn, Asa Griggs Candler Professor of Chemistry and Biology and Howard Hughes Medical Institute Professor, and Leslie Taylor, executive director of the Center for Creativity and the Arts and professor of theater studies. Drawing from the expertise of six fellow Emory graduate students in the natural sciences, social sciences and humanities, the ORDER courses expose freshmen to an array of interdisciplinary perspectives and graduate research currently under way at Emory, with lectures ranging from the origins and treatment of cancer and how drug therapies are developed to topics such as data analysis, creative cognition, and neurobiology and memory. Among many class outings, students visited a Yerkes National Primate Research Center field station and Emory's Winship Cancer Institute, where they met professionals directing Phase I clinical trials for cancer patients and learned about advancements in proton beam therapy being developed at Emory's new high-tech treatment center, slated to open in Midtown in 2016. But it is the opportunity for engagement with actual cancer patients that has the most profound impact, making the science real. Funding for the dinner was made possible by a classroom mini-grant from Emory's Center for Faculty Development and Excellence (CFDE), Umstead notes. Students are surprised — and moved — to discover that Miller-Kleinhenz's father, Curtis Miller, is among their dinner guests, celebrating completion of his own radiation treatment for prostate cancer. Many enrolled in the class out of an interest in health or medicine. Some were drawn because of a friend or relative who battled cancer. Others had no idea what to expect. When the first three classroom lectures concluded with students breaking into applause, Umstead and Miller-Kleinhenz knew they were on the right track. "As a freshman, who gets to do anything like this?" says student Diana Bender-Bier. "I went home over Thanksgiving break and honestly, all I could talk about was this class." When Professor David Lynn was a graduate student, he remembers walking into a chemistry lab every day wondering what was going on in those other buildings on campus. That was the nature of graduate education at the time, especially in the natural sciences, where funding typically came from federal grants paid to graduate students to support their research. Though it remains an effective model, it can be isolating, he notes. Lynn also saw a lost opportunity — graduate students in the sciences were afforded little classroom teaching experience, even though they were likely to apply for teaching jobs down the road. So when Lynn was awarded a $1 million grant from the Howard Hughes Medical Institute in 2001, he sought to create bridges between graduate and undergraduate education. In 2002, the ORDER program was launched to create new learning avenues for undergraduates while also spotlighting the importance of graduate research. Today, Lynn sees the program upholding the ideals of a broad liberal arts education, with interdisciplinary curricula and classes that showcase graduate research from across campus. "Jasmine and MaKendra have done a marvelous job helping students understand the concept of cancer, but they've put such a human touch on it — particularly for freshmen," Lynn says. "For many, it's an experience they might have never had." The ORDER program, which now receives course proposals from nearly 100 applicants a year, is supported by the Emory College of Arts and Sciences, the Laney Graduate School, and affiliated departments of each of the appointed scholars. "Skin boils, nausea, fatigue, gastrointestinal issues, vulnerability to infection … why do side effects happen?" Umstead asks the class. On this day, discussion turns to how chemotherapies are designed to attack fast-dividing cells, which can also impact stomach linings or hair follicles — common and uncomfortable side effects. However, newer targeted cancer therapies try to perform more like snipers, taking aim at cancer cells while leaving healthy cells untouched. "Cancer assassins!" she jokes. "That's what my lab does — helps identify new targets for cancer therapy," she tells the students. "We do that by thinking about the cancer cell as a network, a complicated, non-linear, messy network. Mutations deregulate cell signaling within those protein-to-protein interaction networks." Passing out cards displaying words such as "kinase" and "oncogene" and proteins such as "Aurora Kinase A" and "Ras," she invites students to line up with them, organizing their own signaling pathway. As they laugh and jostle into place, Umstead talks about the important role such pathways are now playing in new cancer therapies that "put a chokehold" on the type of cell signaling that can lead to mutations and cancer. Whereas their freshman seminar is intended to give students new to college life a taste of the research experience, this semester they are presenting the course to seniors, inviting them to imagine their next academic steps. For Umstead and Miller-Kleinhenz, cancer is both a research interest and a professional passion, expressed in scholarship that takes very different directions. With a background in pharmaceutical sciences and plant biology, Umstead is interested in cancer pharmacology, identifying "what it is within the cancer cell we need to understand to help us design better drugs to treat cancer." "The cell is a network of proteins, and with cancer, signals within that network are misregulated — we use high throughput screening and molecular biology to pinpoint what interactions contribute to that,"explains Umstead, whose mother is a breast cancer survivor. For Miller-Kleinhenz, a background in biology and molecular diagnostics honed her interest in studying cancer on a molecular level, including bio-markers and genetics. Her research focuses on determining the underlying mechanism of drug resistance in triple-negative breast cancer and developing new therapies to overcome it, including the use of nanoparticles to deliver drugs directly to cancer stem cells. "As an undergraduate, I had friends who were diagnosed at the same time I was taking my first course in cancer biology," recalls Miller-Kleinhenz, whose grandmother is a breast cancer survivor and grandfather battled lung cancer. Miller-Kleinhenz was a still young girl when her grandmother was first diagnosed. At the time, her mother, TeAndra Miller, vividly recalls her daughter's promise that she was going to "cure cancer" when she grew up. Today, Miller-Kleinhenz and Umstead are doing their best to make that happen. And there is evidence that they're having an impact in the classroom, too. Over winter break, Miller-Kleinhenz received an email from one of their students praising the duo for providing "a great freshman experience." "Your contributions to my education, particularly introducing me to cervical cancer research … have changed the course of my scholastic career," wrote Eboni Freeman, who asked how she could keep following their research.